Every once in a while, I thank the Maker that I did not grow up in the age of social media. Adolescence was hard enough without worrying about my most embarrassing moments–and there were a lot of them–ending up on Facebook, Twitter, or YouTube. As the fat nerd who played the tuba, I was already a target for bullies. I shudder to think what I would have had to deal with had social media been a factor in my life…the way it was for the protagonist of my latest read, The Possibility of Now by Kim Culbertson. In this book, our main character, Mara, feels the need to disappear after she has a major meltdown and someone posts her shame on YouTube. Over half a million hits later, Mara escapes her elite private school in San Diego and journeys to Lake Tahoe to spend several weeks with the father she’s never really known. Mara is hoping that this drastic change in scenery will help to clear her head…and perhaps allow everyone to forget about her public breakdown in the middle of her calculus exam. If only she could forget. Mara makes a detailed plan to get her life back on track, but, as so often happens, plans have a way of changing. She still does a ton of work to stay on top of things at school, but she gradually begins to let go a bit and actually enjoy life in Tahoe. She makes friends who encourage her to live a little and take things less seriously. She sort of begins to know her father. More importantly, Mara begins to realize just who she is and what’s really important to her. Maybe it’s not being perfect or worrying about everyone thinks of her. Maybe is exploring the possibilities around her and learning to truly live in the now. While Mara misses parts of her life in San Diego, she’s coming to love the slower pace and relaxed atmosphere of Lake Tahoe (not to mention the guy who’s captured her interest). As the time nears for her return to San Diego, she wonders if she really wants to go back at all. Maybe she can make a home here with her father and new friends. Maybe she doesn’t have to go back home and face what made her leave in the first place. Can Mara reconcile the person she’s become in Tahoe with who she was in San Diego? Will she be able to face her past while embracing her future? Explore the possibilities when you read The Possibility of Now by Kim Culbertson. In addition to dealing with how social media now plays into adolescence, I think this book also addresses the pressures that young adults face, particularly as it concerns academic performance. I related strongly to this aspect of Mara’s character. Like Mara, I was an overachiever, and I freaked out if I made less than an A on an assignment. This was true all through middle and high school, even into college. I even had a bit of a meltdown when I realized I was doing too much. For me, this didn’t happen until college, and it led me to change my major and eventually find the path that steered me to librarianship. So, I get what Mara went through, and I think a lot of young adults will feel the same. 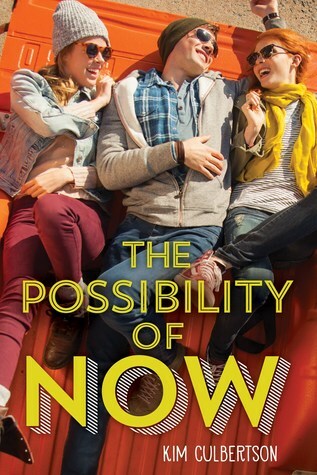 If you’re interested in sharing The Possibility of Now with others, I would recommend it for middle grades and up. Mara is a high school student, so those readers will probably relate more to what she’s dealing with, but it’s accessible to anyone who’s ever wanted to escape an embarrassing situation and try to reinvent themselves somewhere else. Can we all do that in picturesque Lake Tahoe while learning to ski? No, but we can dream. For more information on The Possibility of Now and other books by Kim Culbertson, visit the author’s website. You can also follow her on Twitter and Instagram. I love it when I come across a book that’s different from anything I’ve read before. That’s what I got in Two Summers by Aimee Friedman. At first glance, this book is simple contemporary YA fiction, but it’s more than that. Without getting too technical, Two Summers explores the possibility of parallel universes and how simple decisions can take us on very different paths. Could those diverging paths lead us to the same place? I guess that depends on the situation, but I enjoyed how things played out in this book, which was essentially two stories–or two summers–in one. This is going to be a summer to remember…in more ways than one. Summer Everett, a girl for whom very little ever changes, is planning to spend the summer in France with her father. She’s both nervous and excited about this trip. As she’s about to board her flight, Summer’s phone rings, and she has to decide whether or not to answer this call. Soon she’s soaring over the Atlantic, about to spend the summer in Provence, France. She’ll get to spend some time with her father, a painter, and explore the French countryside. What could be more idyllic? Well, for starters, her father could be at the airport to pick her up. He’s not, and Summer soon learns that he’s the one who was trying to call her earlier. He’s in Berlin, and Summer is now virtually on her own in an unfamiliar country. Summer eventually finds her way to her father’s home, and she’s met by Vivienne, a friend of her father’s, and Eloise, a girl close to Summer’s age who seems to hate her on sight. Things aren’t off to a good start, and they don’t get much better until Summer has a chance encounter with Jacques. Maybe France won’t be so bad after all. Her dad wants her to postpone her trip…as she’s about to board the plane. He’s in Berlin, so what’s really the point of going to France if he won’t be there? Summer turns around and makes her way back to boring Hudsonville, New York, for the same old summer she’s always had. That’s not exactly how things work out, though. Summer’s best friend, Ruby, is drifting away. She’s hanging out with the popular crowd and seems to resent that Summer did not leave for France. What’s Summer to do? Well, for starters, she’s taking a photography class taught by her Aunt Lydia. In this class, she’s exploring her own artistic abilities and getting to know Wren, an eccentric girl from school, and Hugh Tyson, Summer’s long-time crush. Maybe staying home this summer won’t be so bad after all. In both worlds, Summer is experiencing the first stirrings of love and becoming more comfortable in her own skin. What will happen, though, when a scandalous secret throws her entire life into turmoil? The people who claim to love her the most have been keeping something huge from her, something that changes everything. How can she possibly trust anyone after all is revealed? How can she move on from something so earth-shattering? Whether in New York or France, this summer will be one that forces Summer Everett to examine her life–her relationships with family and friends, her own abilities, and what’s holding her back from grabbing what she wants. How will these two summers take her where she needs to go? Read this imaginative novel by Aimee Friedman to find out! 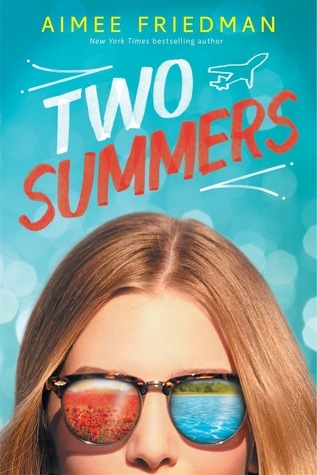 Two Summers, in my opinion, is a great pick for middle and high school readers. Maybe it will encourage readers of all ages to explore the world around them (and beyond) through photography and examine how the choices they make could lead them on different paths. To learn more about Two Summers and other books by Aimee Friedman, visit the author’s website. You can also follow her on Twitter and Instagram. Full disclosure: As much as I enjoy the works of Kate DiCamillo, I read Because of Winn-Dixie against my will. I did not want to read it. I am not one to pick up a “dog book” if I don’t have to. My friend’s nagging, however, was more than my meager willpower could handle, so I sat down to read this book Sunday night. Two hours later, I was finished with the book, and I reluctantly admitted that Because of Winn-Dixie was a sweet, heart-warming story. I’m glad I took the time to read it, and I now see what all of the fuss was about. Opal Buloni doesn’t expect to become a dog-owner when she steps into her new town’s grocery store that fateful day. But that’s just what happens. She takes one look at the big, smiling, rough-around-the-edges dog and knows that she has to take him home…and save him from the angry grocery store manager. And so Winn-Dixie, a dog named after a supermarket, comes into Opal’s life and begins to change her world. Opal isn’t sure how her father is going to feel about Winn-Dixie, but it doesn’t take long for the dog’s smile and gentle presence to do its work. The whole town feels it. This dog leads Opal to make unlikely friends, including the town librarian, a five-year-old who thinks all parties should have a theme, an ex-con who works in the pet store and has a special way with music, and a nearly blind woman who some in town believe to be a witch. Through it all, Opal grows closer to the people in her new town…even some she made snap judgments about in the beginning. She also begins to learn more about her own mother, a woman who Opal never really got the chance to know. She becomes a more understanding, compassionate, and caring person. And all because of Winn-Dixie. So, yeah…I liked this book even though I really resisted reading it in the first place. I guess that’ll teach me to judge a book by its dog. I think Because of Winn-Dixie is wonderful if you’re looking for a book that emphasizes things like empathy, friendship (especially those that are rather unlikely), and even forgiveness. It takes a gentle look at all of these things without being too preachy…which is kind of cool since Opal’s dad is actually a preacher. Because of Winn-Dixie is a great read for any age level. It’s a good read-aloud for younger grades, and kids in upper elementary grades on up will find it to be a quick yet powerful book that will stay with them for years to come. 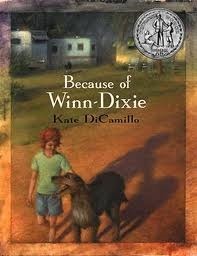 If you’d like to learn more about Because of Winn-Dixie and other books by the amazing Kate DiCamillo, check out her website. Once again, it’s time to bring you yet another of the nominees for the 15-16 South Carolina Children’s Book Award. This time, we turn our attention to Half a Chance by Cynthia Lord. 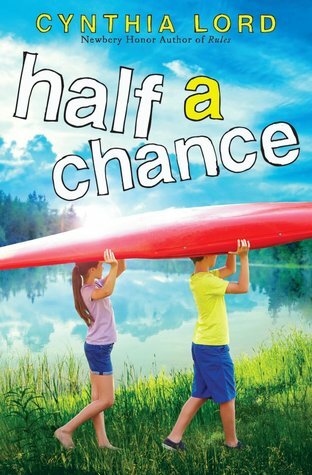 Half a Chance is a quick, engaging read that I think will speak to readers in upper elementary grades on through middle school. The setting is appealing, the characters’ adventures may encourage young readers to do some exploring of their own, and their struggles are true to life. Most readers–young and old–are sure to find something to relate to in this book. Lucy and her family have just moved to a lake house in New Hampshire. Almost immediately, Lucy’s dad, a famous photographer, jets off on a job, leaving Lucy and her mom with the tasks of unpacking and getting to know their new surroundings. Before Lucy’s father leaves for his trip, he inadvertently gives Lucy both a chance to explore her new home and a way to find out if her photos are really good. Dear old dad is judging a kids’ photo contest–a scavenger hunt of sorts–and Lucy sees this as her chance to prove herself to her father. Lucy looks for potential photo subjects everywhere, including next door. It is there that she meets Nate, a boy who visits the lake with his family each summer. Nate decides to help Lucy with her photo project and, in the process, introduces her to some of the best parts of her new home. They look for loons and their chicks (and try to figure out a way to protect them), they climb a mountain, and they work together to get the perfect photos for Lucy’s contest. But one day, in Lucy’s quest for a great photograph, she snaps a shot that reveals more than Nate is ready to see. In it, Nate’s Grandma Lilah looks scared and lost, and her deteriorating memory is right there for everyone to see. Nate doesn’t want Lucy to use the photo in her contest, but Lucy knows that this particular picture is powerful, shows great emotion, and truly captures what Lilah is going through. How can she not use it? As the summer winds down, Lucy must decide what to do about the contest. Should she enter the photo of Grandma Lilah even though it could damage her friendship with Nate? Should she enter the contest at all, knowing that she could be disqualified for being the daughter of the judge? Will her father ever take her seriously as a photographer? Answer these questions and many more when you read Half a Chance by Cynthia Lord. Okay…first off, I love the photography contest featured in this book. My hope is that my students read Half a Chance and get inspired to do their own photo scavenger hunt. Maybe I’ll make that a library-based activity for students who read the book. I don’t know yet. I’m still playing around with things in my head, but what an awesome way to integrate literature and visual arts! Secondly, I think this book could help readers to see and experience the larger world around them. Even Lucy, who usually viewed everything behind a camera lens, realized that some things simply need to be lived. One needs to be in the moment, taking everything in, and not worrying about capturing the perfect photo. (This applies if the photo is for a contest like Lucy’s or…maybe for a Facebook or Instagram post.) A lot of people could take this message to heart. I also like how Half a Chance featured loons and talked about the many dangers they (and other animals) face in the wild. In this book, the characters decided to do something to spread awareness about loons, their habitats, and how community members could protect these birds. That’s a great example for young readers interested in protecting animals and the environment or just getting involved in their communities in whatever way they can. Finally, this book takes a look at dementia from a kid’s perspective. (We see a little of what it’s like for Grandma Lilah, but the primary focus is on Nate and Lucy.) When I was a kid, I watched my great-grandmother slowly decline due to Alzheimer’s disease, so this really resonated with me. How great would it have been for me to read about a character going through the same thing? I’m guessing that other readers will be able to see themselves in Nate–wondering when his grandmother just won’t remember him anymore–and this book may help those readers to cope just a little better and look for ways to make this terrifying time easier for their loved ones and those around them. Half a Chance is an excellent book, and I’m thrilled with its placement on next year’s SC Children’s Book Award nominee list. I hope my students feel the same way. For more information on this book and other by Cynthia Lord, click here. The title of this book alone should have told me that I would love it. (I did.) I am an unapologetic band geek, and I probably always will be. Notes from an Accidental Band Geek allowed me to relive some of the happiest memories of my adolescence, and I imagine that any former or current marching band members will feel the same. This book could also show prospective band members–and maybe even those who look down on this bunch of dorks (I’m looking at you, Jim Rome)–just how awesome marching band really is. Seriously, band geeks are the coolest people in any school, and no one will ever convince me otherwise. Elsie Wyatt lives and breathes music. Her main goal in life is to take over her father’s position as principal French horn player for the Boston Symphony Orchestra. She’s just got a few things to get through first…like band camp. As part of the requirements for the prestigious Shining Birches summer music camp, Elsie must take part in a musical ensemble. For Elsie, that means joining her new high school’s marching band. She’s confident in her ability to play her horn, but that confidence takes a big hit on her first day of band camp. Not only is she encountering a musical culture that she never expected–one in which she’s humiliated before things even get started–but she’s also being forced to trade in her gorgeous French horn for a mellophone, a poor substitute that will require her to essentially start from scratch. Yeah…this is going to be a blast. Now, Elsie must worry about perfecting her audition piece for Shining Birches as well as learning a new instrument, marching techniques, even more music, and navigating the tough waters–and friendships–that come with entering high school. And the friendship thing seems to be the hardest thing for Elsie to handle. Her horn has always been her best friend, and she doesn’t really know how to really talk to people, how to focus on someone other than herself, or how to control her temper when she’s having a troubles (musical or personal). She has to find a way to be a better friend, something that is becoming more and more important to her. Even as Elsie is learning–and loving–more about the marching band and the friends she’s making, she’s still struggling with the pressure to be great. While part of her really wants to hang out with her band friends and let loose a little, she knows she must stay focused if she wants to earn a spot at Shining Birches and prove to her father that she’s a worthy, serious musician. She knows he doesn’t think she has what it takes, and Elsie will do just about anything to prove him wrong. All of her intense focus, though, is turning Elsie into someone she doesn’t like or even recognize. (The people around her aren’t so crazy about her, either.) She’s snapping at everyone, even the people who would be there for her if she’d only let them, and her increasing anxiety is about to cause her to break. And when one more thing is added to Elsie’s already full plate, she has to decide whether she’ll rise to the occasion or buckle under the pressure. Join Elsie in the wonderful world of marching band–band camp, rehearsals, passing out, bizarre rituals, parades, football games, competitions, pranks, bus rides, and much more–and learn how the one thing she thought would be nothing more than a means to an end has the power to change her entire life. My time with the marching (and concert) band was my favorite part of school. Most of my friends were in the band, and I spent every spare moment with them in the band room. I have so many fond memories of band camps, football games, and competitions, and I still try to take in at least one marching band or DCI (Drum Corps International) competition every year. (I’ve blocked out most of the sunburn, dehydration, soreness, yelling, running laps, crying, and all the other not-so-great stuff that comes with being part of this tight-knit group of awesomeness.) Not to be too melodramatic or anything, but marching band is a way of life, and it’s something that stays with you long after your last show. Erin Dionne, the author of this amazing book, totally gets that. 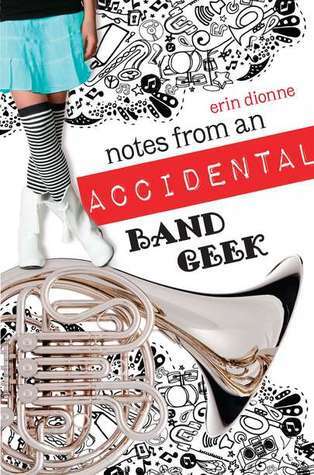 For more information on Notes from and Accidental Band Geek and author Erin Dionne, check out her website and Twitter. Enjoy! *Sadly, my time in the band came before digital photography was huge, so I have very few pictures of these wonderful moments. Here’s one, though, that I’m willing to share with the masses. I finished a book today that I can hardly wait to share with my students and teachers at school. 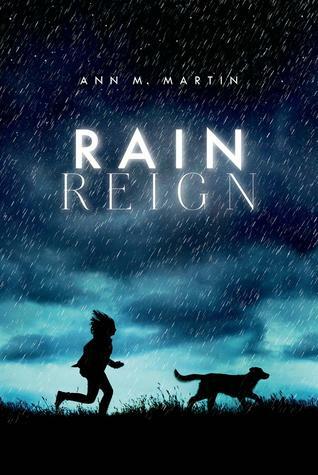 That book is Rain Reign by Ann M. Martin. It was released last week, and it’s already earned a spot on several must-read lists. I predict that this book will find a place on several award lists as well. 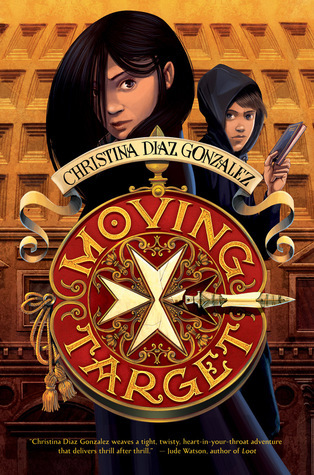 It’s absolutely amazing, and this book should be included in every elementary and middle school library collection (at the very least). In Rain Reign, we meet Rose Howard, a young girl who has been diagnosed with high-functioning autism (also known as Asperger’s Syndrome). Her voice shines on every page, and readers get a small glimpse of what life is like for Rose. Rain Reign is a must-read for anyone–especially educators and other caregivers–who have any interaction with high-functioning autistic children. I know I was able to see one of my students in the character of Rose, and this excellent book may have provided me with just a bit more understanding. Fifth grader Rose Howard loves homonyms, prime numbers, rules, and her dog Rain (whose name has two homonyms). Rain is the one of the few gifts Rose’s father has ever given her, and their bond is a strong one. When nearly everyone else–including Rose’s father–gets irritated by Rose’s obsessions, Rain is always there to provide a comforting and calming presence. Comfort and calm is something that Rose will sorely need in the days to come. Hurricane Susan is making a beeline for Rose’s small Massachusetts town, and her precious routines will be tossed to the winds. The power goes out, creeks turn into rivers, bridges are washed out, trees fall…and Rose’s father lets Rain out of the house without checking on her return. When the storm finally passes through, Rose realizes that her dog is missing. Did she forget her way home in the horrible storm? Was she carried downstream by the powerful currents? Where is Rain? Rose doesn’t understand how her father could have let this happened, but she’s determined to find her beloved dog…even if that means letting go of her routines. Rose searches high and low for Rain. She enlists the help of her uncle, her teachers, and even her classmates. Rose does everything humanly possible to find her dog, but how will she handle it when she finds more than she was looking for? Will her world be thrown into yet another storm, and how will Rose–a girl who needs routine and consistency–deal with the fallout? How will she handle the many changes to come? Read Rain Reign by the brilliant Ann M. Martin to find out. As soon as I return to school next week (I’m on fall break right now), I plan to hand this book over to my guidance counselor. (In addition to working with autistic students, she’s also a dog lover.) Several other teachers may also benefit from reading this book. I think Rain Reign could be unbelievably useful in communicating with and understanding autistic students. In addition to being enlightening for educators and students, parents of high-functioning autistic children may also find this book to be helpful, especially if the parents don’t really know how to communicate with their children. Rose’s uncle provides an example of a good caregiver. Her father is the opposite. As a matter of fact, I wanted to punch Rose’s father in the face on more than one occasion. Rain Reign is also a great book for students who have fondness for word and number play. This could even come into play in language arts or math lessons. Class studies of this book could include looking for homonyms that weren’t mentioned by Rose or finding prime numbers out in the “real world.” And don’t even get me started on how this book could be used to illustrate character’s voice. Read one chapter, and you’ll see that for yourself. I don’t know that I’ve adequately conveyed it in this post, but I love everything about Rain Reign. It definitely tugged at the heartstrings (yes, I cried), but it taught valuable lessons. Rose was a brave girl who worked past her own issues when something was important to her. She tried to understand others even when it seemed like no one understood her. She always wanted to do the right thing and follow the rules…when it would have been much easier–and far less painful–to just “go with the flow.” Rose is a character, much like August Pullman in R.J. Palacio’s Wonder, who we’ll be talking about for a long time to come. For more information on Rain Reign and other books by Ann M. Martin, go to her official website, Facebook, Goodreads, or Twitter. If you’ve worked with elementary or middle grade readers, I likely don’t have to tell you how popular books in diary/journal format are. I can’t keep books like Diary of a Wimpy Kid, Dork Diaries, Dear Dumb Diary, or even Dear America books on the shelves. These books are quick, entertaining reads that kids tend to devour. I predict that This Journal Belongs to Ratchet will be no different. Ratchet is looking for her life to change. This lonely girl–who is homeschooled by her father–wants to make friends, be more like other girls, and finally have something new in her life. Ratchet is sure that having a mother would make everything different, but there’s not much she can do about that. (Her mother died when Ratchet was just a little girl.) Even so, Ratchet works to make things change…hopefully for the better. Ratchet explores her feelings through a journal. Now, this journal is supposed to be for a homeschool language arts assignment, but Ratchet knows her dad will never read it, so she pours all of her feelings onto the pristine white pages. She uses her writing assignments–poetry, freewriting, descriptive essays, letters, and many others–to describe her frustrations with her father. His obsession with saving the environment and looking insane at every town hall meeting, his insistence on homeschooling Ratchet, never buying anything new, always needing her help in the garage, and his refusal to talk about her mom. It’s not easy being the daughter of the town joke, and Ratchet hates feeling embarrassed all the time. (Her dad may not care what others think of him, but Ratchet does.) She loves her dad, but she longs for more in her life. Things would be so much better if she just had one real friend, but the kids in the neighborhood always make fun of Ratchet because of her dad…and because both of them are always covered in grease from working on cars. Things may be on the verge of changing for Ratchet, though. When her dad begins teaching a class at the community center on how to build go-carts, Ratchet begins using the lessons her father taught her to get closer to the boys in the class. They really seem to value her knowledge, and Ratchet feels good about helping them. In the process, she even makes a close friend, Hunter, a boy who used to be part of the crowd that teased her so much. As Ratchet explores her life, her relationship with her dad, and her feelings about her new friendship, she gradually realizes that maybe it’s not so important to be “normal.” Maybe her dad has been teaching her the important things in life all along. Sure, he’s a little crazy sometimes–and he often makes her mad–but he fights for the things he believes in, he’s true to himself, and, most importantly, he’s always been there for Ratchet. Perhaps her dad isn’t so crazy after all. Maybe what Ratchet really needs to change in her life is her own perspective. When she realizes just how lucky she actually is, she can do anything she sets her mind to. I often tell my students that normal is boring. Well, Ratchet is anything but boring. I don’t know of many kids who can rebuild an engine, change a tire, teach others to build their own go-carts, and be motivated enough to do school work without any help. Ratchet is a fascinating character, and I think many readers will find her journey of self-discovery inspiring and enlightening. I also believe that readers who see themselves as kind of different will see a kindred spirit in Ratchet. And who knows? Her story could even inspire young readers–particularly girls–to learn more about auto mechanics. I think This Journal Belongs to Ratchet could be a very powerful teaching tool in elementary and middle grade language arts classes. I envision classes reading this book together and then writing in their own journals. Students could take Ratchet’s example, and write their own poems, essays, letters, and even modern-day fairy tales, using their own lives as inspiration. All in all, I’m very happy that this book was chosen as a 14-15 SCCBA nominee. It’s an entertaining, thought-provoking book that could help readers explore their own difficulties, frustrations, and even victories through writing. I hope the students and teachers in my school feel the same. 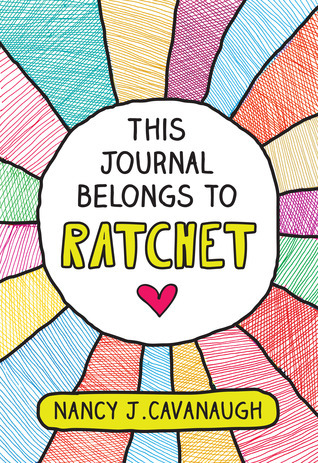 This Journal Belongs to Ratchet is the first book by author Nancy J. Cavanaugh. To learn more about this author and future books, visit her website, Facebook, and Twitter.